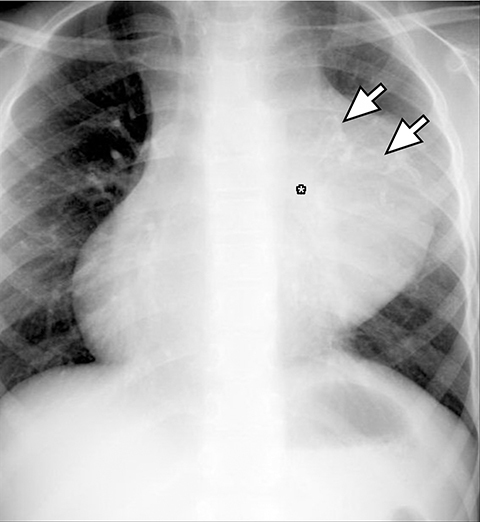 The mediastinum is the most common location of an intrathoracic mass in children. Differentiating abnormal mediastinal contours from the normal mediastinum on a chest radiograph and recommending appropriate further imaging evaluation are essential steps in correct diagnosis of mediastinal abnormalities. 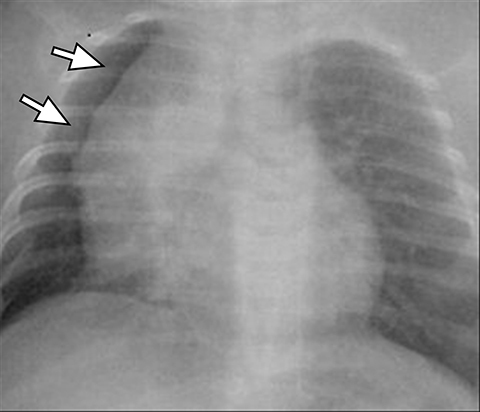 Some imaging features of the mediastinum, such as variation in the appearance of the normal thymus, are unique to the pediatric patient. The radiologist should be attuned to recognize normal variations to prevent misdiagnosis in this age group. 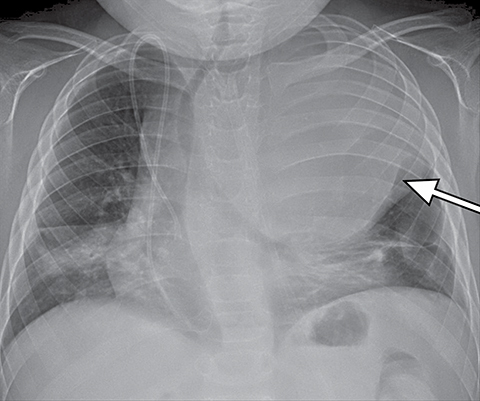 This review will highlight the compartmental approach to diagnosing a mediastinal mass in a child by demonstrating imaging examples of the more common differential diagnoses. Imaging pitfalls will also be addressed with specific tools suggested to avoid misdiagnosis or over diagnosis. 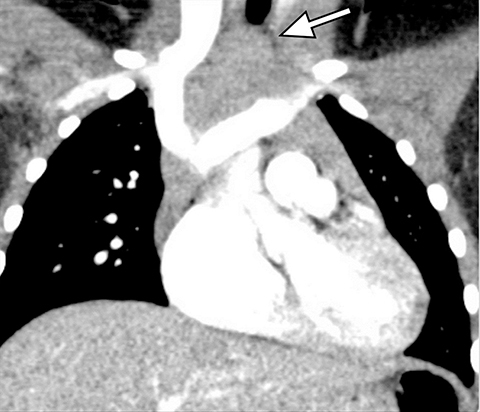 The new ITMG classification system divides the mediastinum into three compartments. The first is the “prevascular compartment,” which is located between the anterior chest wall and an imaginary line anterior to the pericardium. This compartment is bounded superiorly by the thoracic inlet and extends inferiorly to the level of the diaphragm. The second compartment is the “visceral compartment,” which is enclosed by the anterior pericardium and extends posteriorly to an imaginary vertical line drawn 1 cm posterior to the anterior cortex of the thoracic vertebral bodies. 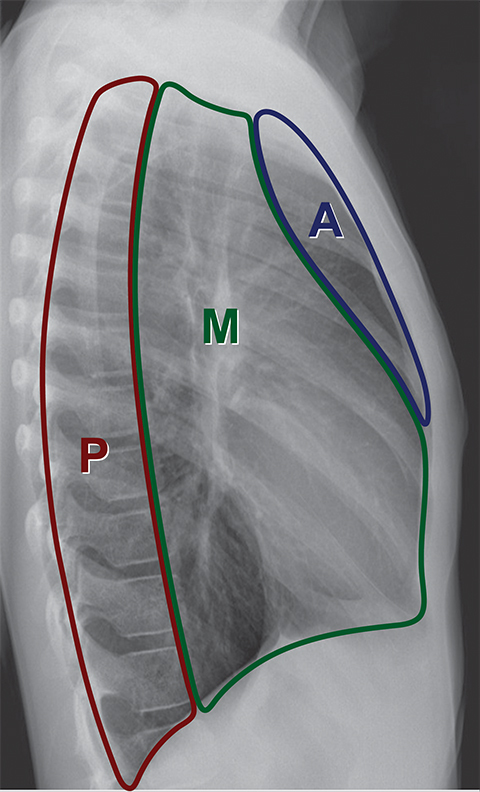 Superior and inferior boundaries include the thoracic inlet and diaphragm, respectively. 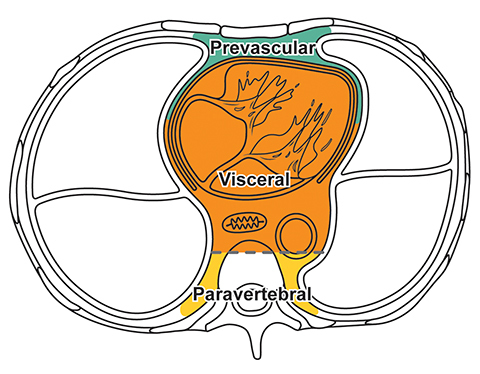 The final compartment is the “paravertebral compartment,” which is located posterior to the imaginary anterior line drawn 1 cm posterior to the anterior cortex of the thoracic vertebral bodies and laterally extends to the level of the transverse processes of the vertebral bodies. This compartment is limited posteriorly by the posterior chest wall and extends from the thoracic inlet to the diaphragm (Figures 2A-B). Remembering the normal structures within each compartment allows for a comprehensive differential diagnosis for a mass arising from the mediastinum. Table 1 summarizes the differential diagnosis for a mass arising from the mediastinum in a child. 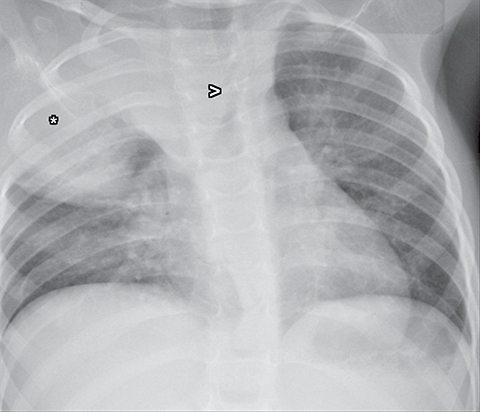 A normal thymus can be misleading in the diagnosis of a mediastinal mass in a child. The normal thymus can take on a variety of shapes and sizes and still be considered normal (Figures 3A-C). It can extend superiorly to the level of the thyroid gland (Figure 4A), inferiorly to the diaphragm or posteriorly to a retrocaval position (Figure 4B). 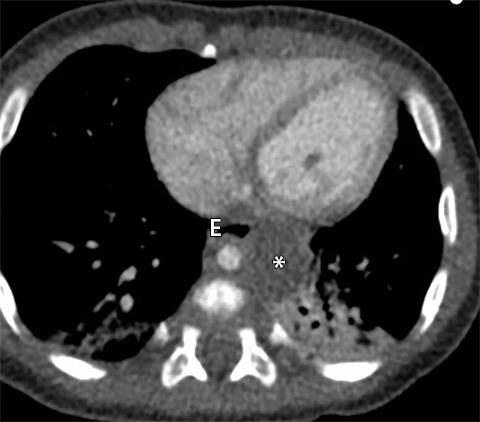 One of the most important features of a normal thymus is the lack of mass effect on the adjacent vascular structures or airway.10,11 On contrast-enhanced CT, it should also demonstrate uniform enhancement. 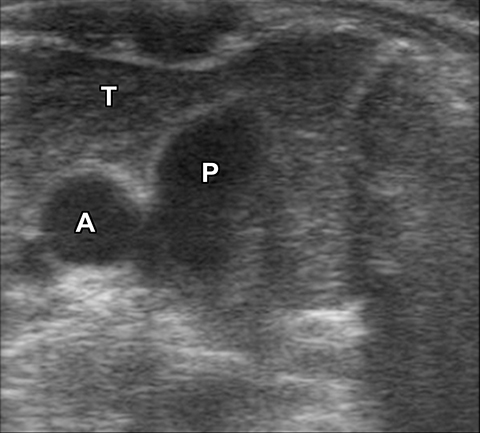 If any uncertainty remains on radiography, sonographic evaluation of the thymus can be helpful in avoiding misdiagnosis or additional unnecessary imaging (Figure 5).12 A normal thymus on ultrasound should appear homogenous, well-defined with internal echogenic strands and remain hypoechoic relative to the thyroid gland (Figure 5C).13 Change in shape during respiratory cycle may also help identify the normal thymus, as the tissue is pliable and molds to surrounding structures.14 When the thymus extends into the lower neck or retrocaval region, its texture should be identical to that of the normal thymus located in the anterior mediastinum. In general there are two types of thymic hyperplasia: true thymic hyperplasia and lymphoid thymic hyperplasia. In lymphoid thymic hyperplasia, there is an increased number of germinal centers and medullary lymphocytes. This entity can be seen in autoimmune conditions such as myasthenia gravis, thyrotoxicosis, systemic lupus erythematosus, autoimmune hemolytic anemia, Hashimoto thyroiditis and Addison’s disease.15 It can also be associated with malignancy. In this type of hyperplasia, the thymic gland is not necessary larger, however there is an increase number of the lymphoid follicles within the thymic gland. Primary epithelial neoplasms arising from the thymus are extremely rare in the pediatric population and represent less than 1% of mediastinal masses in this age group.17 Thymomas are divided into invasive and noninvasive subtypes and are generally associated with an unfavorable prognosis. Thymoma is commonly associated with immunologically-related diseases such as myasthenia gravis, both in children and adults. 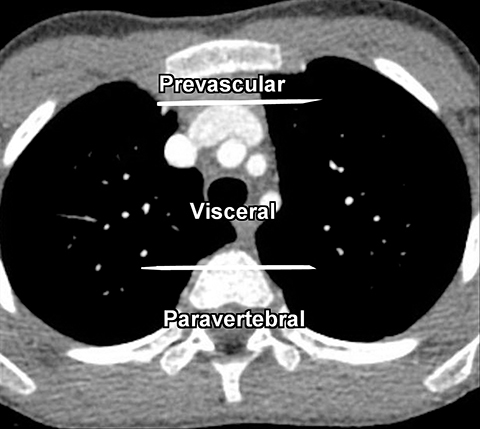 The prevascular compartment is the most common location for an extra- gonadal germ cell tumor and accounts for 6-18% of mediastinal masses in children.21 Rarely, these tumors can arise from the paravertebral compartment or the pericardium in the visceral compartment. Most of these tumors, approximately 80%, are benign. The most common pathologic subtype is the mature teratoma.14,22 Mature teratomas contain well-differentiated tissues from ectodermal, mesodermal, and endodermal germ cell layers and any tissue type may be found within the tumor. 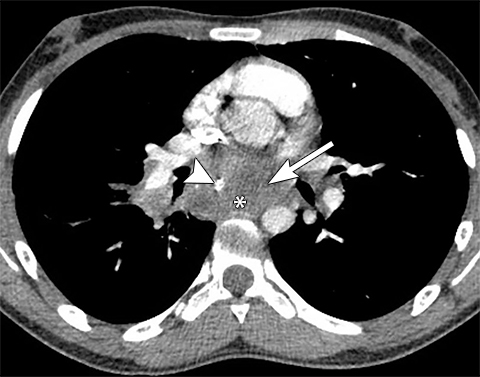 On conventional radiography, teratomas appear as lobular anterior mediastinal masses with or without visible calcification (Figure 8A). 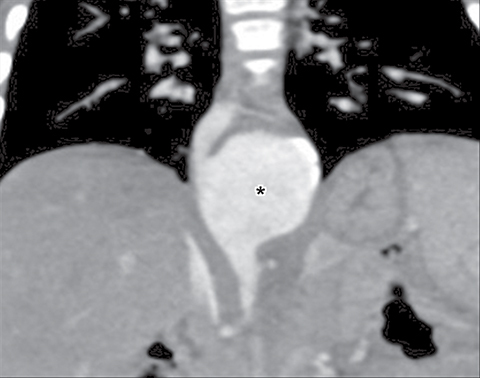 On CT, components of fat, fluid and calcifications are readily detected (Figures 8B). While more aggressive imaging features such as the presence of an enhancing soft tissue mass invasion to adjacent structures, inhomogenous enhancement, necrosis or hemorrhage are suggestive of malignancy, imaging differentiation between the benign mature and the malignant immature teratoma is not always possible.14 Other histologic sub-types of germ cell tumor are seminoma and nonseminoma tumors. On imaging, seminomas are usually large, lobular and homogenous solid soft tissues masses which can metastasize to regional lymph nodes and bone. Nonseminoma germ cell tumors are heterogeneous with areas of necrosis and hemorrhage and invade adjacent structures (Figure 9).23 Differentiation based on imaging alone is not always possible. Evaluation of laboratory markers such as alpha fetoprotein and human chorionic gonadotropin can help in this regard. 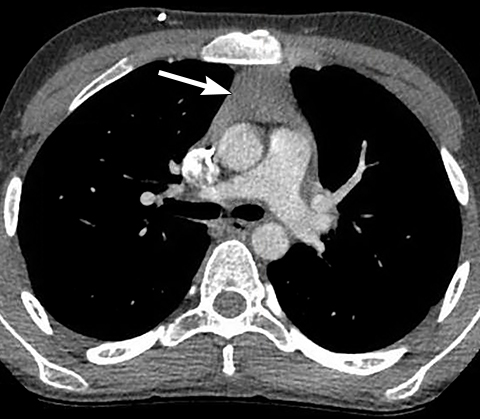 On CT, lymphoma usually presents as a low attenuation prevascular compartment mass extending into different mediastinal compartments (Figure 10). Areas of necrosis and inhomogenous enhancement are possible. Calcifications are rare prior to treatment but may develop in the nodal mass or within discrete lymph nodes following treatment.26 Since lymphoma may arise from or involve the thymus, it may be difficult to differentiate malignancy from an enlarged thymus on cross-sectional imaging. Lobular, bulky borders, heterogeneous attenuation or signal intensity, and displacement of adjacent structures are helpful to sort out a normal thymus from lymphomatous involvement of the thymus. When evaluating mediastinal masses and specifically an anterior mediastinal mass, close attention to the patency of the airway and mediastinal vascular structures is essential. 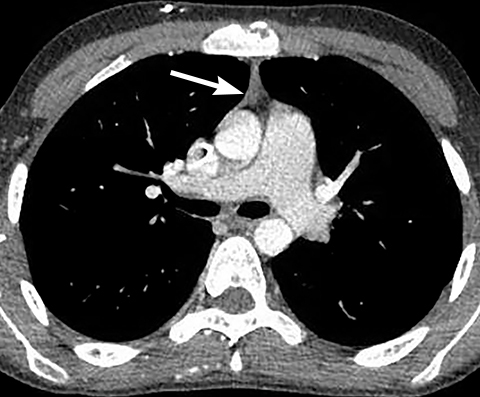 Airway or vascular compression may be exacerbated during anesthetic induction with the patient lying supine for imaging or biopsy purposes leading to a life-threatening emergency such as complete airway obstruction and cardiovascular collapse (Figure 10).28,29 If the radiologist suspects severe airway or vascular compromise, suggesting an ultrasound-guided approach to biopsy with the patient in an upright or semi-upright position or diagnostic imaging in the prone or lateral position may be safer. 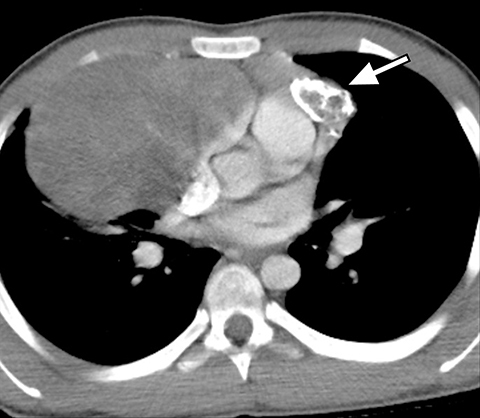 Thymic cysts and lymphatic malformations can present as cystic masses in the mediastinum. 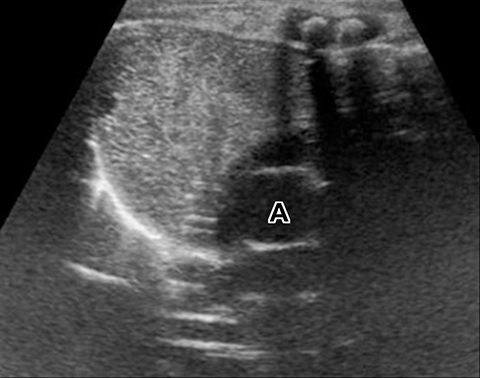 Thymic cysts are either congenital or acquired. 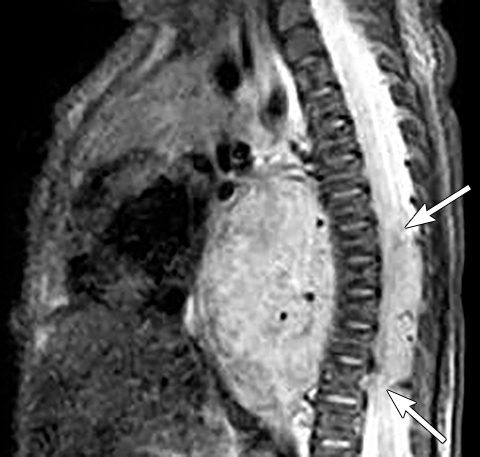 Lymphatic malformations can occur in any part of the mediastinum and are characterized on cross-sectional imaging as a trans-spatial fluid attenuation or fluid signal single or multiloculated mass with only peripheral and septal enhancement. The normal structures in the visceral compartment are the heart, aorta, intrapericardial pulmonary arteries, pulmonary veins, trachea, esophagus and mediastinal and hilar lymph nodes. It is very important to exclude the possibility of vascular lesions for any mediastinal abnormality detected on radiograph. Knowledge of medical history, predisposing conditions such as trauma or vasculopathy (Figure 11), any prior cardiovascular surgery, and a high degree of suspicion for a vascular abnormality will help arrive at a correct diagnosis. 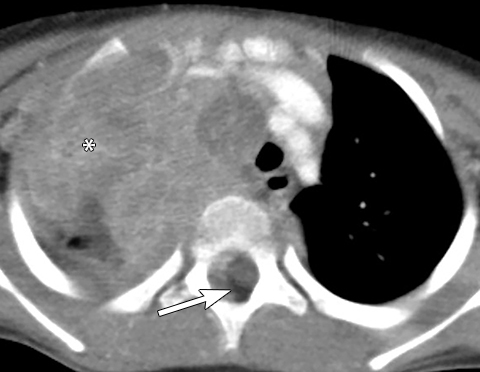 Bronchogenic cysts are typically located in the precarinal and subcarinal regions (Figure 12) but may occur in any part of the mediastinum and even be intrapulmonary (20%). Esophageal duplication cysts are usually close to the esophagus (Figure 13). 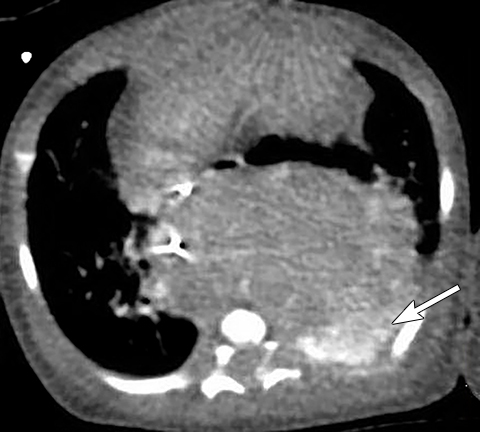 About 50% of foregut duplication cysts will demonstrate features of simple cysts on imaging, those being water attenuation on CT or fluid signal on MRI with only thin peripheral enhancement, however in the setting of intralesional hemorrhage or infection, complex internal fluid or increased CT attenuation values can be seen. Lymph node enlargement is common in children and usually non-specific on all imaging modalities. Infectious (Figure 14) and inflammatory etiologies are more common but malignant etiologies such as lymphoma or metastatic disease can appear similarly. Normal structures in the paravertebral compartment are neurogenic tissue, paravertebral fat and lymph nodes. 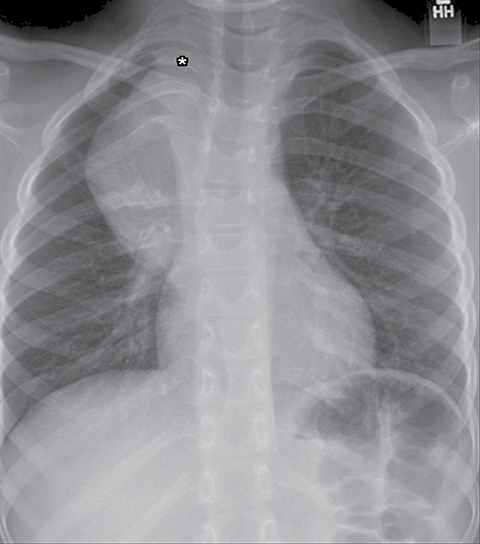 Most masses in this compartment are neurogenic in origin (85-90 %).30 In routine practice, evaluation of chest and abdomen radiographs in children should include close inspection of the paraspinal lines for widening or loss of definition, evaluation for rib destruction or intercostal space widening. 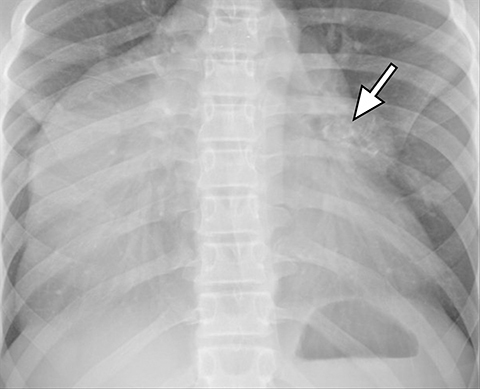 Occasionally a paravertebral mass will be picked up by an astute radiologist on first line radiographs (Figure 15) in an asymptomatic patient or a patient with nonspecific symptoms. Neurogenic tumors are divided into sympathetic ganglia tumors, peripheral nerve sheath tumors, and paragangliomas. Other paravertebral masses are less common but include vascular abnormalities (Figure 16), small round blue cell malignancies (Ewing’s sarcoma, lymphoma and rhabdomyosarcoma), extramedullary hematopoiesis, and lipomatosis. 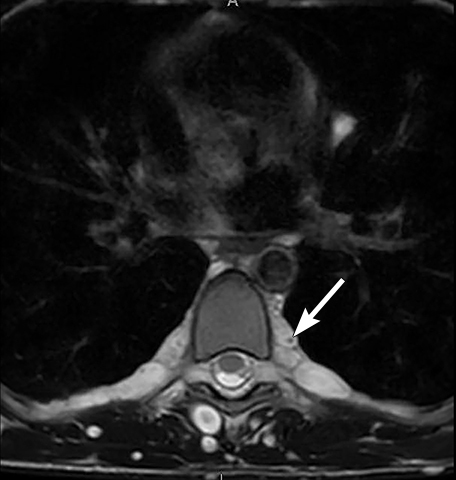 MRI should be performed in any patient with a suspected neurogenic paravertebral tumor. 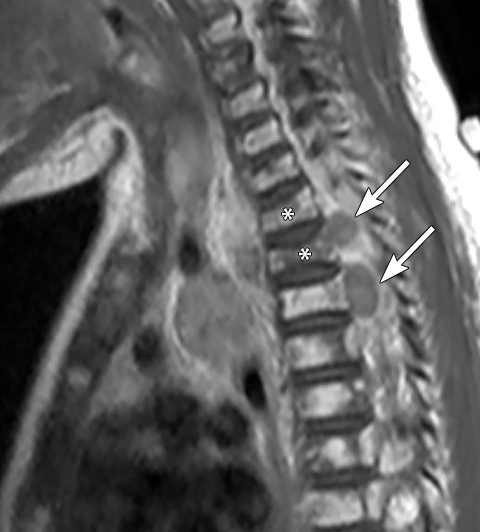 The extent of disease and invasion into the spinal canal is better evaluated with MRI because of its superior tissue contrast. 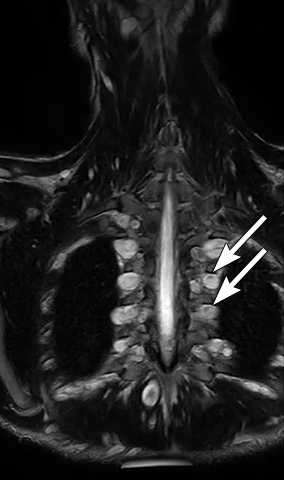 Calcifications are seen in at least 30% of neuroblastomas on plain radiography and 80%–90% on CT.31,34 Posterior mediastinal neuroblastoma may cause splaying or erosion of adjacent ribs, pedicle erosion on radiograph (Figure 16) or intraspinal extension on cross-sectional imaging. These features help to recognize the origin of the mass from the paravertebral compartment. On MRI, neuroblastoma (Figure 17) and ganglioneuroblastoma (Figure 18) are typically heterogeneous, relatively low signal intensity on T1-weighted images and high signal intensity on T2-weighted images with variable enhancement. Calcification may be difficult to detect on MRI but sometimes can be seen as areas of signal void. Tumors arising from peripheral nerves in the thoracic region (such as neurofibroma and neurofibrosarcoma) or from the nerve sheath (such as schwannoma) can occur in children but with less frequency compared to ganglion cell tumors and certainly less common compared to adults. On chest radiograph these tumors are seen as smooth and well defined soft tissue opacities in the paravertebral region which may cause rib remodeling, rib splaying, neural foramina enlargement or scalloping of posterior vertebral bodies. 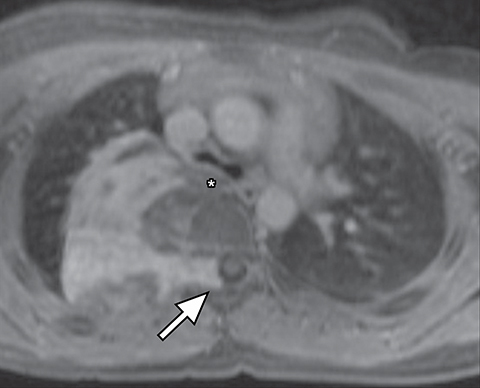 On CT, these tumors are usually smooth, round or oval in shape, homogenous in attenuation and iso or hypoenhancing compared to the chest wall musculature on contrast-enhanced imaging. The schwannomas, especially the larger ones, can be heterogeneous in appearance.39 On MRI, peripheral nerve and nerve sheath tumors are usually hypo- or iso-intense compared to chest wall musculature on T1-weighted sequences. On T2-weighted sequences, neurofibromas shows increased peripheral T2 signal intensity with central low signal, resulting in a “target” appearance (Figure 20). Schwannomas tend to demonstrate more inhomogeneous high T2-weighted signal. These tumors show avid contrast-enhancement. 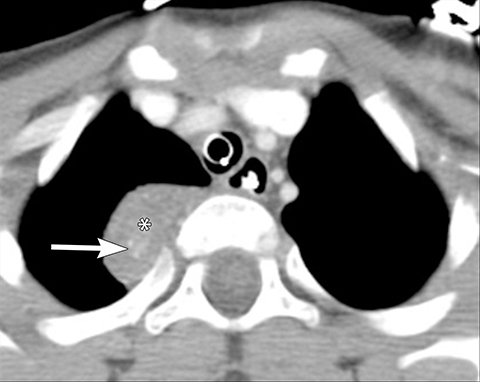 Using a compartmental approach to evaluating a mediastinal mass on both radiographs and cross-sectional imaging allows for a comprehensive differential diagnosis by the radiologist. 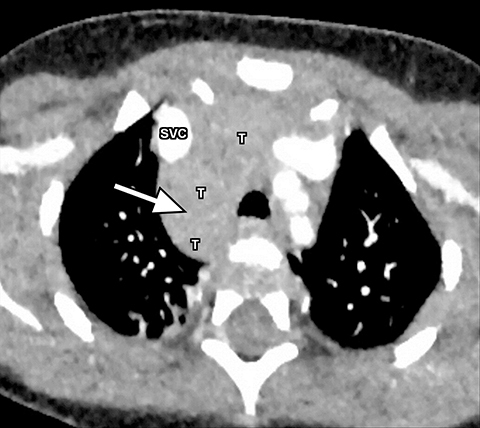 This review paper discusses the use of the new ITMG mediastinal compartment classification system and how it can be applied to diagnosing a mediastinal mass in children. 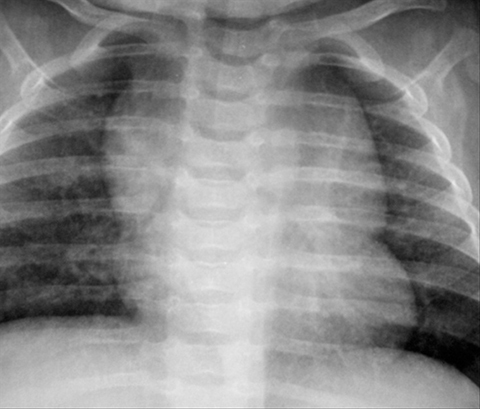 When approaching a mediastinal abnormality in a child, awareness of normal structures that may mimic a mass, such as the thymus, and knowledge of mediastinal masses that are more common in children, such as neuroblastoma, lymphoma, congenital foregut duplication cysts and congenital vascular abnormalities will be helpful. Whitten CR, Khan S, Munneke GJ, et al. 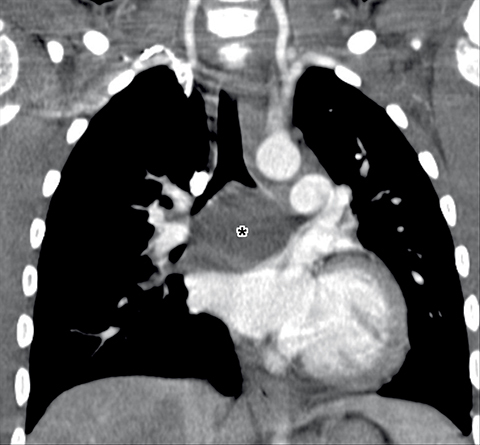 A diagnostic approach to mediastinal abnormalities. Radiographics. 2007;27(3):657-671. Lee EY. 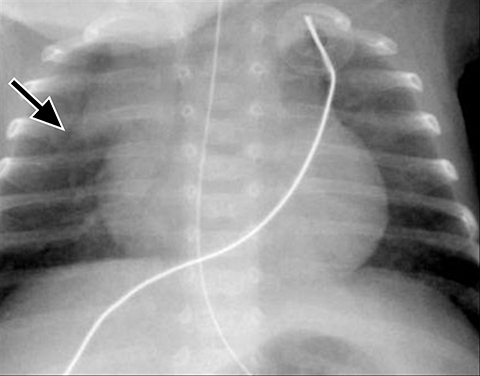 Evaluation of non-vascular mediastinal masses in infants and children: an evidence-based practical approach. Pediatr Radiol. 2009;39 Suppl 2:S184-S190. Brown K, Aberle DR, Batra P, Steckel RJ. Current use of imaging in the evaluation of primary mediastinal masses. Chest. 1990;98(2):466-73. Merten DF. 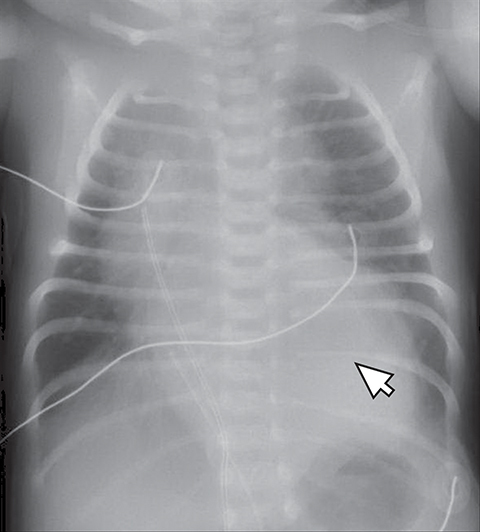 Diagnostic imaging of mediastinal masses in children. AJR Am J Roentgenol. 1992;158(4):825-32. Thacker PG, Mahani MG, Heider A, Lee EY. Imaging Evaluation of Mediastinal Masses in Children and Adults: Practical Diagnostic Approach Based on A New Classification System. J Thorac Imaging. 2015;30(4):247-267. Meza MP, Benson M, Slovis TL. 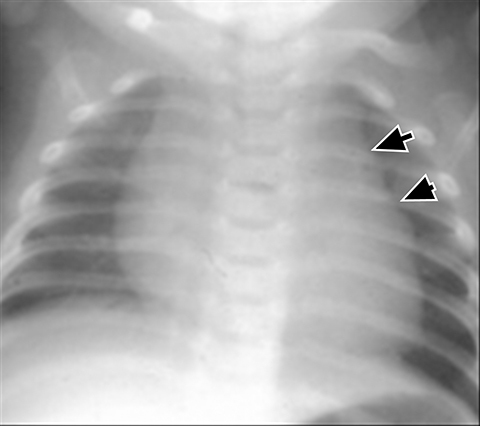 Imaging of mediastinal masses in children. Radiol Clin North Am. 1993;31(3):583-604. Felson B. The Mediastinum Semin Roentgenol. 1969;4:41–58. Carter BW, Tomiyama N, Bhora FY, et al. A modern definition of mediastinal compartments. J Thorac Oncol. 2014;9(9 Suppl 2):S97-101. Fujimoto K, Hara M, Tomiyama N, Kusumoto M, Sakai F, Fujii Y. Proposal for a new mediastinal compartment classification of transverse plane images according to the Japanese Association for Research on the Thymus (JART) General Rules for the Study of Mediastinal Tumors. Oncol Rep. 2014;31(2):565-572. Mong A, Epelman M, Darge K. Ultrasound of the pediatric chest. Pediatr Radiol. 2012;42(11):1287-1297. Kim OH, Kim WS, Kim MJ, Jung JY, Suh JH. US in the diagnosis of pediatric chest diseases. Radiographics. 2000;20(3):653-71. Adam EJ, Ignotus PI. Sonography of the thymus in healthy children: frequency of visualization, size, and appearance. AJR Am J Roentgenol. 1993;161(1):153-5. Han BK, Suh YL, Yoon HK. Thymic ultrasound. 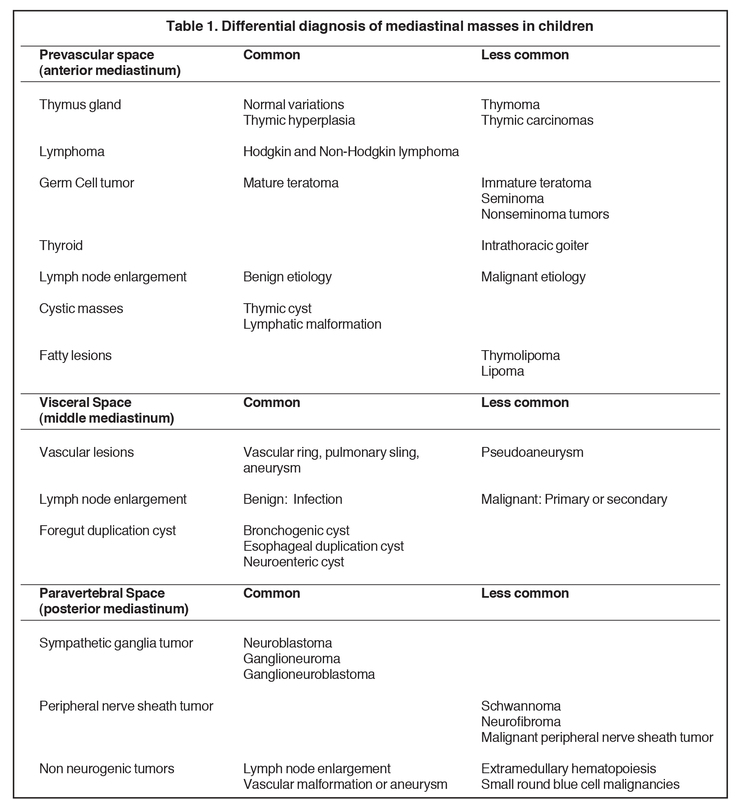 I. Intrathymic anatomy in infants. Pediatr Radiol. 2001;31(7):474-9. Nasseri F, Eftekhari F. Clinical and radiologic review of the normal and abnormal thymus: pearls and pitfalls. Radiographics. 2010;30(2):413-28. 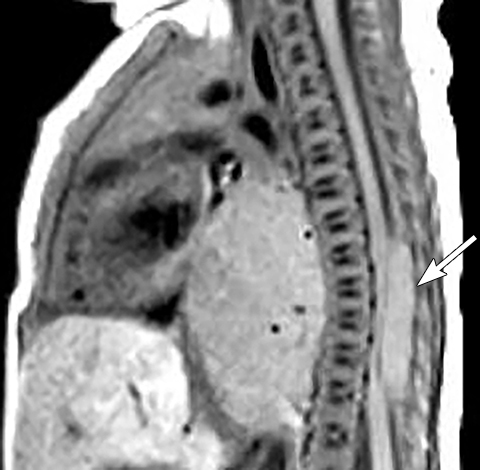 Tian L, Cai PQ, Cui CY, Mo YX, Gong X, Fan W. Reactive thymic hyperplasia following chemotherapy for children with lymphoma: computed tomography may be able to provide valuable information to avoid over-treatment. Eur J Cardiothorac Surg. 2015;47(5):883-9. Sun DP, Ding CY, Wang L, et al. 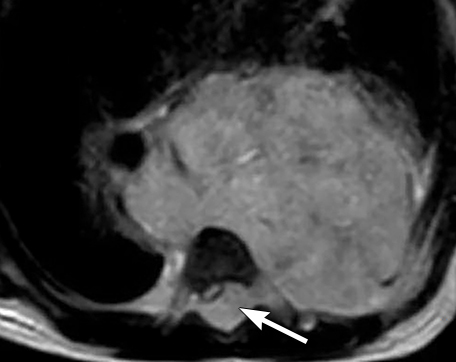 Thymic hyperplasia following chemotherapy in adults with lymphoma: (18)F-fluorodeoxyglucose positron emission tomography/computed tomography findings and correlation with T cell repopulation. Leuk Lymphoma. 2015;56(8):2344-9. King RM, Telander RL, Smithson WA, Banks PM, Han MT. Primary mediastinal tumors in children. J Pediatr Surg. 1982;17(5):512-20. Ozawa Y, Hara M, Shimohira M, Sakurai K, Nakagawa M, Shibamoto Y. Associations between computed tomography features of thymomas and their pathological classification. Acta Radiol. 2015. Stachowicz-Stencel T, Orbach D, Brecht I, et al. Thymoma and thymic carcinoma in children and adolescents: a report from the European Cooperative Study Group for Pediatric Rare Tumors (EXPeRT). Eur J Cancer. 2015;51(16):2444-52. Ranganath SH, Lee EY, Restrepo R, Eisenberg RL. 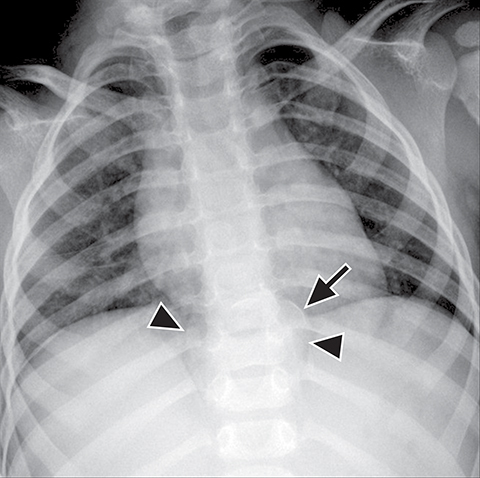 Mediastinal masses in children. AJR Am J Roentgenol. 2012;198(3):W197-216. Billmire DF. Germ cell, mesenchymal, and thymic tumors of the mediastinum. Semin Pediatr Surg. 1999;8(2):85-91. Webb R. The mediastinum: mediastinal masses. In: Webb RW HC, ed. 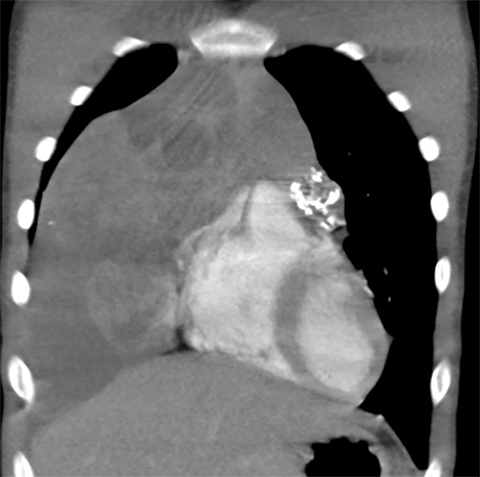 Thoracic imaging: pulmonary and cardiovascular radiology. Philadelphia,Pa:: Lippincott Williams & Wilkins, 2005. Tomiyama N, Honda O, Tsubamoto M, et al. Anterior mediastinal tumors: diagnostic accuracy of CT and MRI. Eur J Radiol. 2009;69(2):280-288. Wright CD. Mediastinal tumors and cysts in the pediatric population. Thorac Surg Clin. 2009;19(1):47-61, vi. Glick RD, La Quaglia MP. Lymphomas of the anterior mediastinum. Semin Pediatr Surg. 1999;8(2):69-77. Carter BW, Wu CC, Khorashadi L, et al. 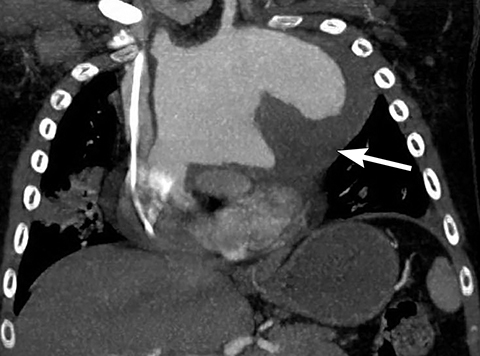 Multimodality imaging of cardiothoracic lymphoma. Eur J Radiol. 2014;83(8):1470-1482. Maturen KE, Blane CE, Strouse PJ, Fitzgerald JT. Pulmonary involvement in pediatric lymphoma. Pediatr Radiol. 2004;34(2):120-124. 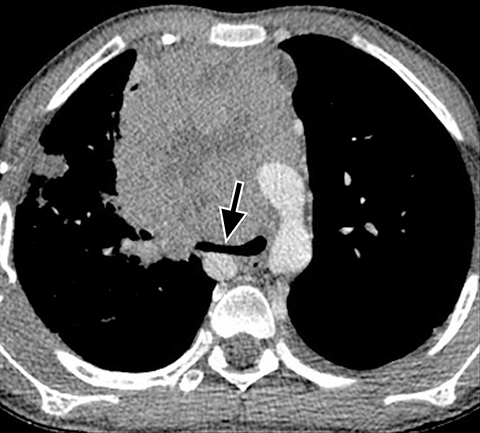 Rath L, Gullahorn G, Connolly N, Pratt T, Boswell G, Cornelissen C. Anterior mediastinal mass biopsy and resection: anesthetic techniques and perioperative concerns. Semin Cardiothorac Vasc Anesth. 2012;16(4):235-242. Slinger P, Karsli C. Management of the patient with a large anterior mediastinal mass: recurring myths. Curr Opin Anaesthesiol. 2007;20(1):1-3. 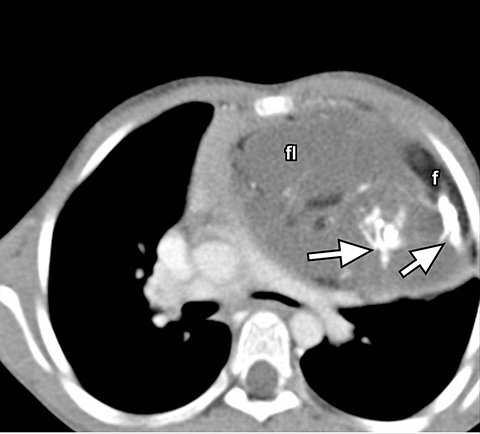 Strollo DC, Rosado-de-Christenson ML, Jett JR. Primary mediastinal tumors: part II. Tumors of the middle and posterior mediastinum. Chest. 1997;112(5):1344-57. Lonergan GJ, Schwab CM, Suarez ES, Carlson CL. Neuroblastoma, ganglioneuroblastoma, and ganglioneuroma: radiologic-pathologic correlation. Radiographics. 2002;22(4):911-34. Kang CH, Kim YT, Jeon SH, Sung SW, Kim JH. Surgical treatment of malignant mediastinal neurogenic tumors in children. Eur J Cardiothorac Surg. 2007;31(4):725-30. Morris JA, Shcochat SJ, Smith EI, et al. Biological variables in thoracic neuroblastoma: a Pediatric Oncology Group study. J Pediatr Surg. 1995;30(2):296-302; discussion -3. Stark DD, Moss AA, Brasch RC, et al. Neuroblastoma: diagnostic imaging and staging. Radiology. 1983;148(1):101-5. Bleeker G, Tytgat GA, Adam JA, et al. 123I-MIBG scintigraphy and 18F-FDG-PET imaging for diagnosing neuroblastoma. Cochrane Database Syst Rev. 2015;9:CD009263. Geoerger B, Hero B, Harms D, Grebe J, Scheidhauer K, Berthold F. Metabolic activity and clinical features of primary ganglioneuromas. Cancer. 2001;91(10):1905-13. Scherer A, Niehues T, Engelbrecht V, Modder U. Imaging diagnosis of retroperitoneal ganglioneuroma in childhood. Pediatr Radiol. 2001;31(2):106-10. Ichikawa T, Ohtomo K, Araki T, et al. 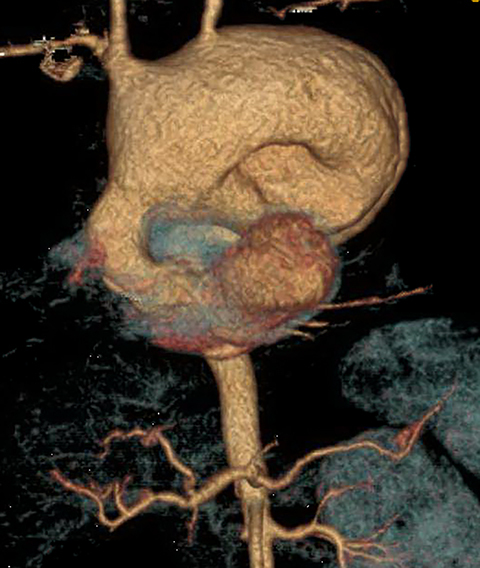 Ganglioneuroma: computed tomography and magnetic resonance features. Br J Radiol. 1996;69(818):114-21. Pavlus JD, Carter BW, Tolley MD, Keung ES, Khorashadi L, Lichtenberger JP, 3rd. Imaging of Thoracic Neurogenic Tumors. AJR Am J Roentgenol. 2016:1-10. Verstraete KL, Achten E, De Schepper A, et al. 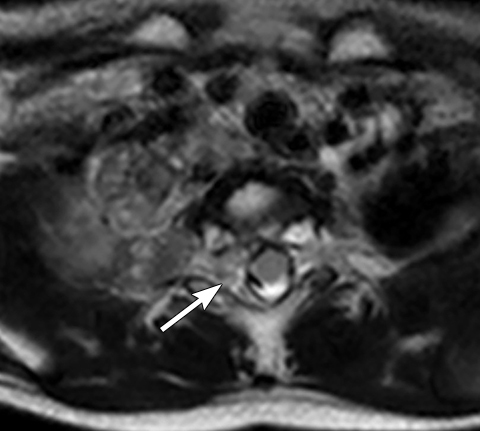 Nerve sheath tumors: evaluation with CT and MR imaging. J Belge Radiol. 1992;75(4):311-20. Lee JY, Lee KS, Han J, et al. Spectrum of neurogenic tumors in the thorax: CT and pathologic findings. J Comput Assist Tomogr. 1999;23(3):399-406. Wasa J, Nishida Y, Tsukushi S, et al. MRI features in the differentiation of malignant peripheral nerve sheath tumors and neurofibromas. AJR Am J Roentgenol. 2010;194(6):1568-74. O’Sullivan P, O’Dwyer H, Flint J, Munk PL, Muller N. Soft tissue tumours and mass-like lesions of the chest wall: a pictorial review of CT and MR findings. Br J Radiol. 2007;80(955):574-580. 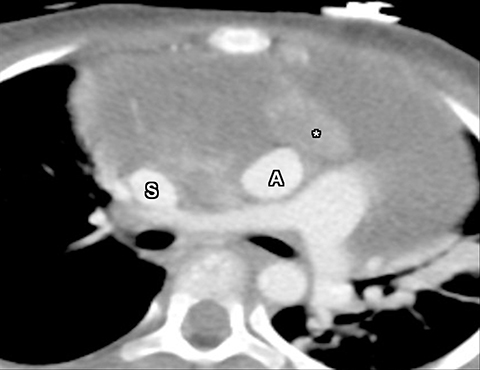 Leschied JR, Sanchez R, Ghadimi Mahani M. Imaging evaluation of pediatric mediastinal masses: Pearls and pitfalls. Appl Radiol. 2017;46(11):8-20. Dr. Leschied is a Clinical Assistant Professor and Dr. Sanchez is a Clinical Assistant Professor in the Section of Pediatric Radiology, and Dr. Ghadimi Mahani is a Clinical Assistant Professor in the Division of Cardiothoracic Radiology and the Section of Pediatric Radiology, at C.S. Mott Children’s Hospital and the University of Michigan Health System in Ann Arbor, MI. A portion of the article was presented as a CME talk at The 17th Radiology at Seashore University of Michigan CME Meeting in March 2016 by Dr. Ghadimi Mahani.